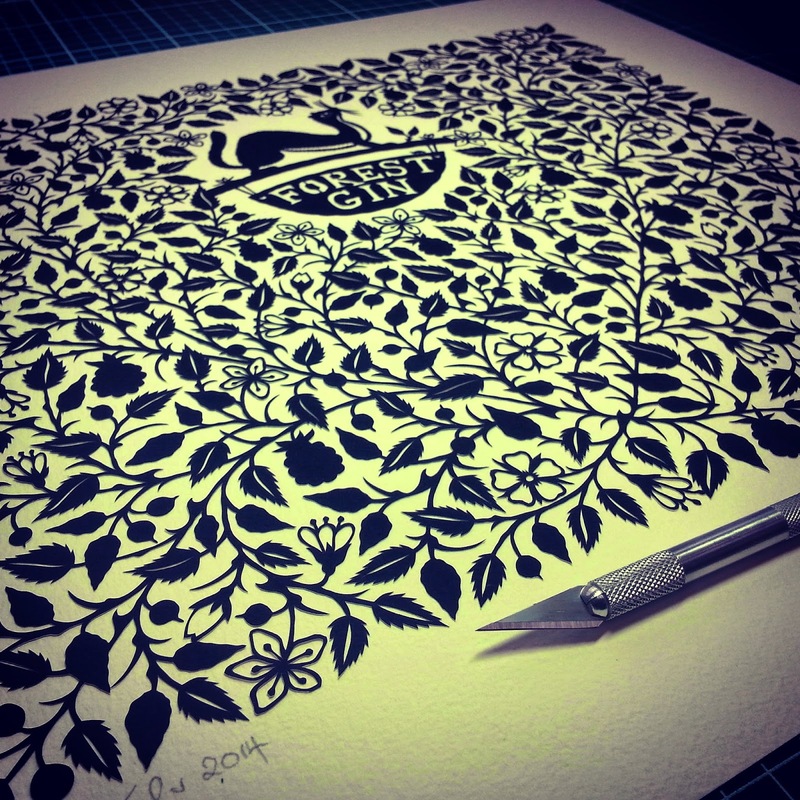 If you're selling your papercuts, you might want to add another string to your bow by adding colour prints to your offering. 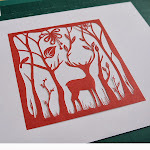 It's not hard to make your papercuts into colour prints, but you do need to have a scanner and Adobe Photoshop. I only have Photoshop Elements, which is a very abridged version, but it's absolutely fine for this particular purpose. 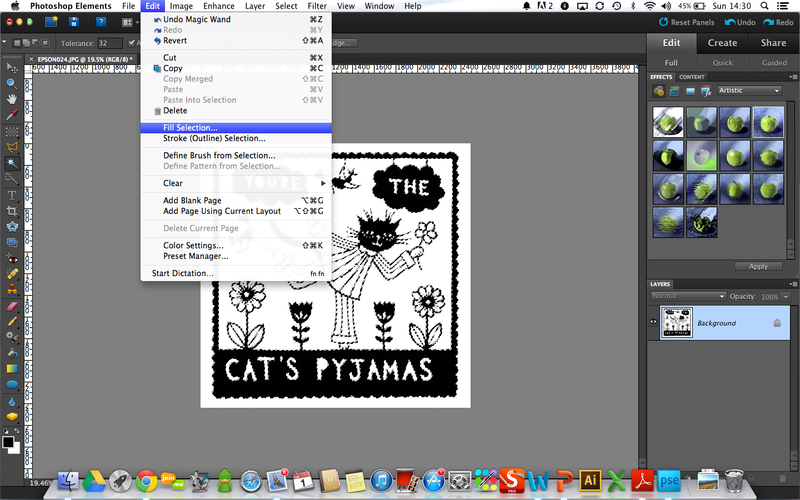 So the first thing you need to do is scan your papercut and save it onto a memory card. 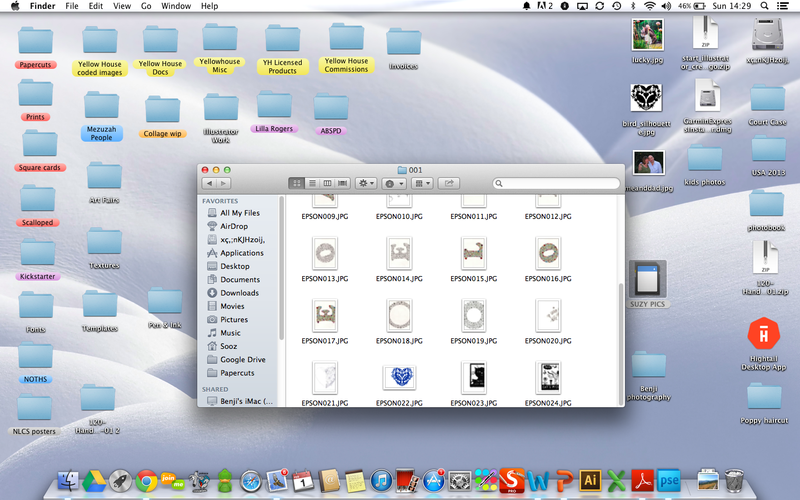 Once you've done that, plug the memory card into your PC or Mac. 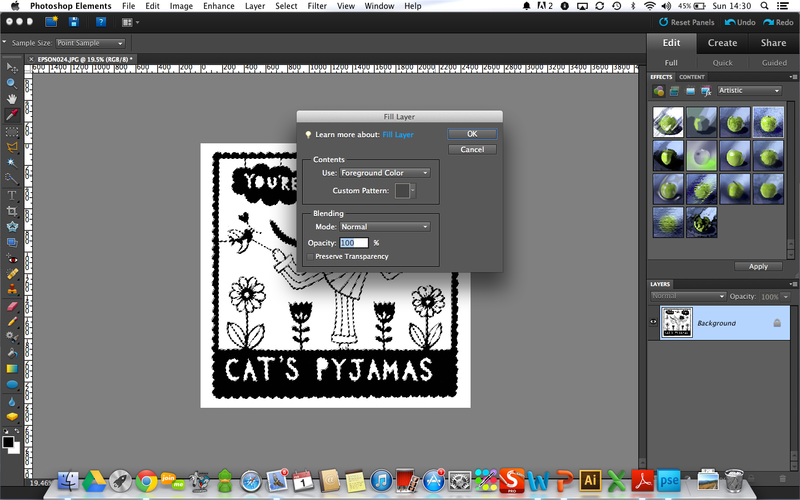 Open up your memory card and drag your scanned image into photoshop. See below image. Check the image is 300dpi. Using the crop tool from the menu bar on the left, trim down your image and press enter or click the green arrow at the bottom right corner of your scanned image. Remember, this is a scanned image, so you need to clean it up and flatten it. 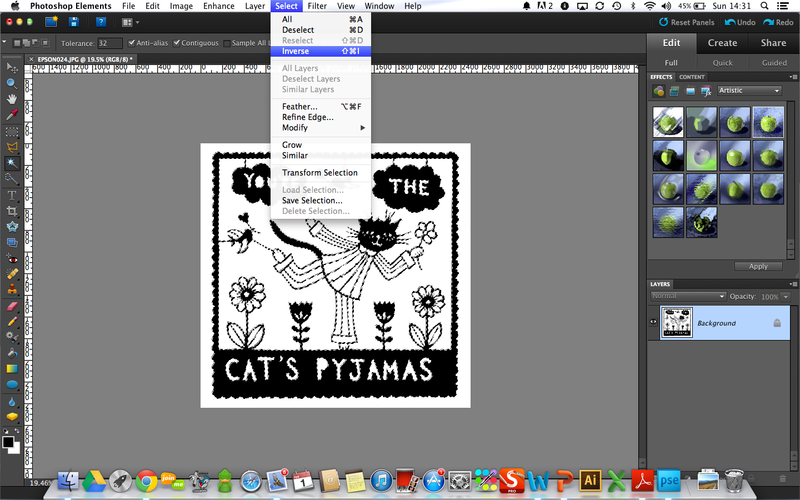 To do this, select the magic wand tool and click on the black area of your image. Make sure the colour swatches in the bottom left of your screen are on the default black and white. When you've clicked on the black area a flashing dotted line will surround all the selected black on your image. In my picutre, all the black is connected so it's all 'live' when I select it. Fill selected area with 'Foreground' colour - this is the black. You then want to click Select>Inverse. This will switch the live selected area from the black to the white. You can then fill the white area with the 'Background' colour in the same way as you filled the black. Your image is now purely black and white. 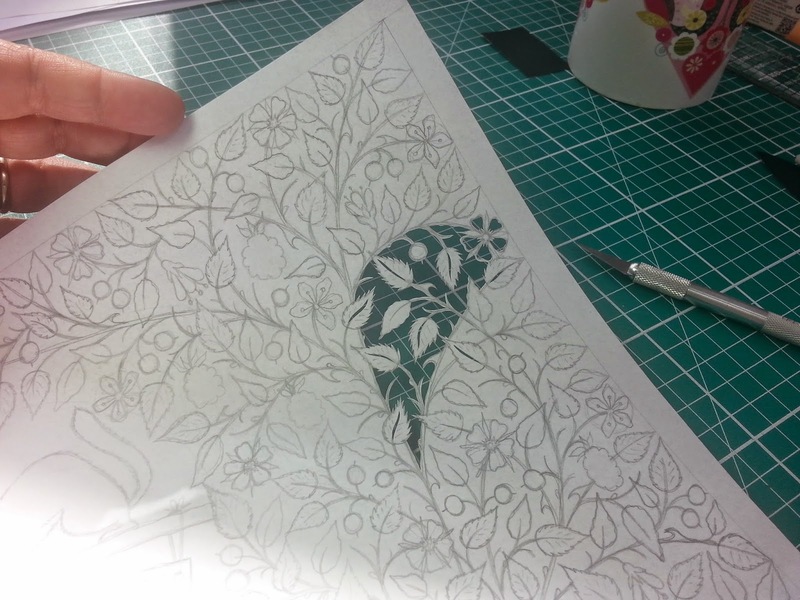 In my design I have lines connecting the birds to the border. I don't want these lines in my print, so I need to remove them. To do this, I use the pencil tool selected as 'white'. Draw carefully over the black lines that you no longer need. This will make the birds actually look like they're flying. I also removed the lines that connected the clouds to the border. This will make the clouds look like they're floating. So now, your image is completely cleaned up and lines removed that you don't want to appear in your print. 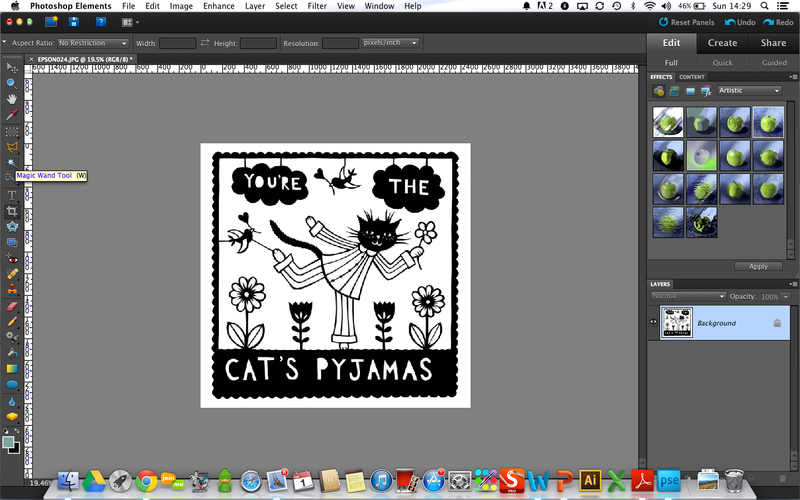 You can now start the fun part of colouring your design. To colour your piece you can use the magic wand and the Edit>Fill method - like you used to make your image black and white. To select multiple areas with the magic wand - eg the separate petals of the flower - select the magic wand tool and click in one of the petals, then holding the shift key, use the magic wand to select the other petals that you want to be the same colour. 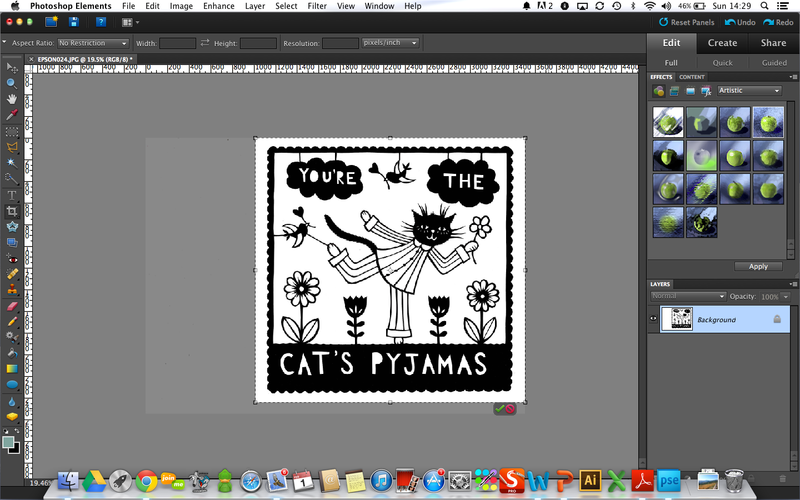 Then Edit>Fill with the colour of your choice from the colour palette. Remember to save your image regularly. If you want your image to be printed, you must make sure your image is 300 dpi. 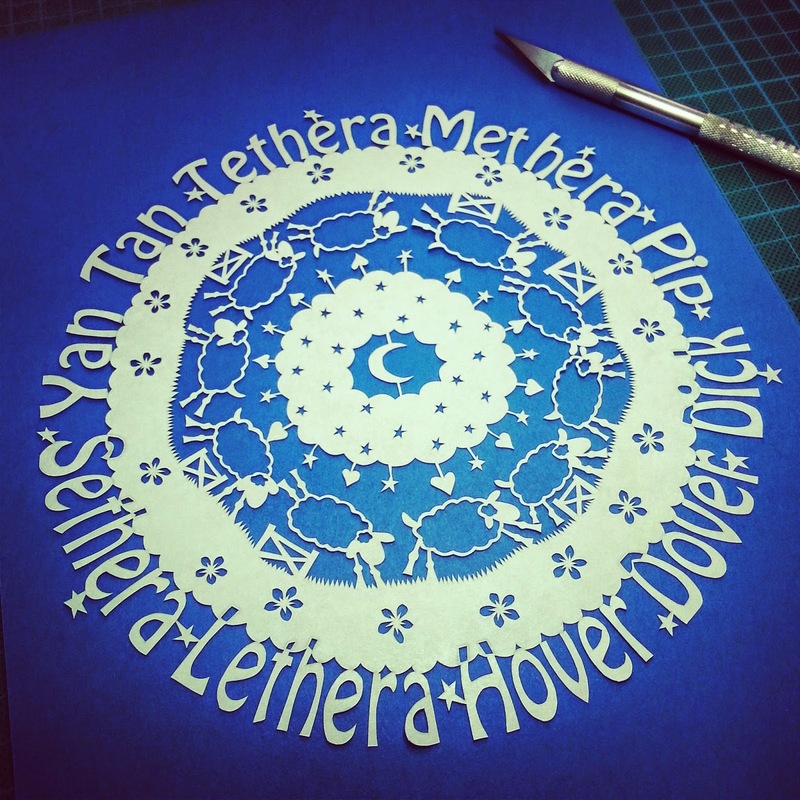 So, recently I've been making my designs into templates and selling them in my Etsy shop (www.folkartpapercuts.etsy.com). 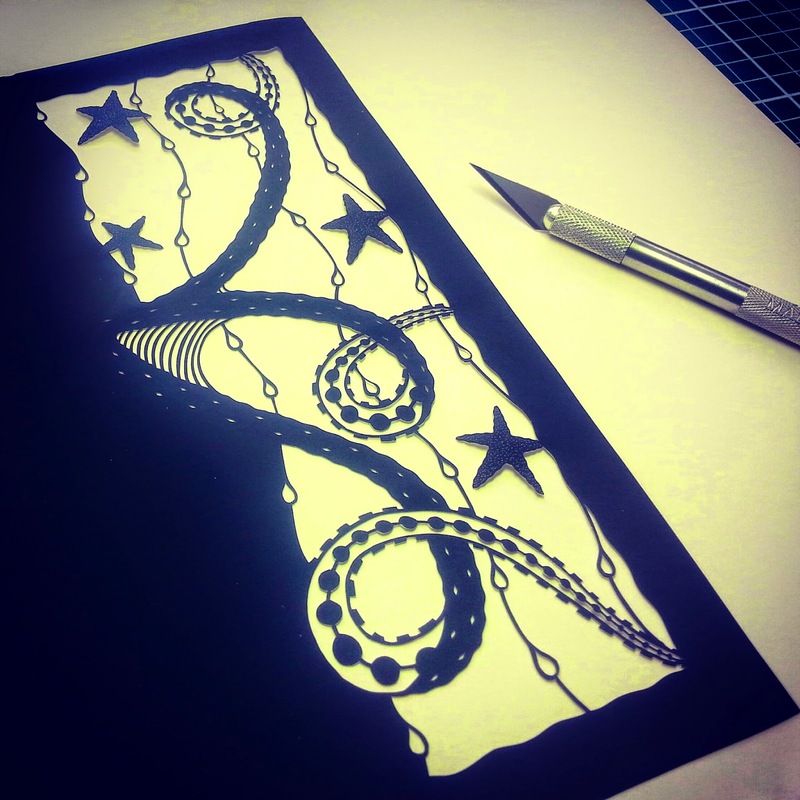 Usually a make the papercut and then create the template by scanning in the finished design and cleaning it up in Photoshop. This time, however, I thought I'd try and create it a different way. 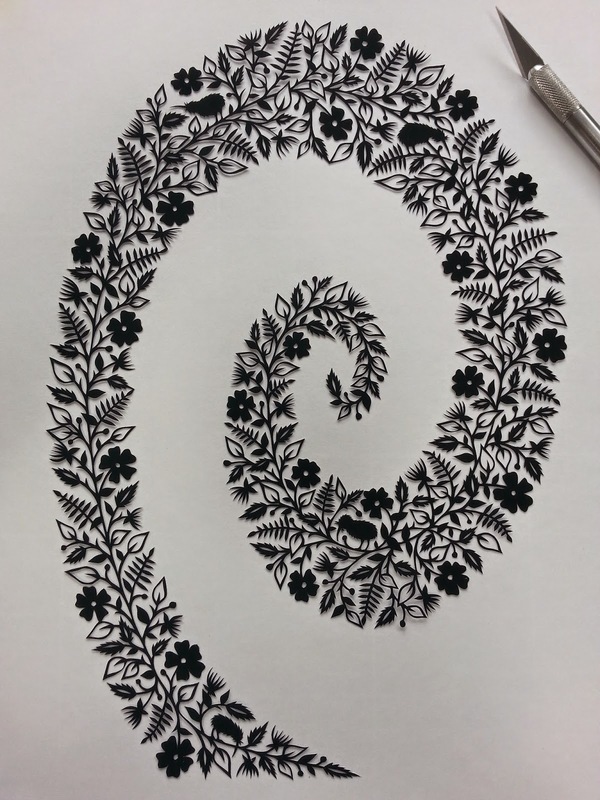 I drew out half my design - by hand in pencil. Then I scanned my hand-drawn image into Adobe Illustrator and digitally traced it on my Wacom tablet. 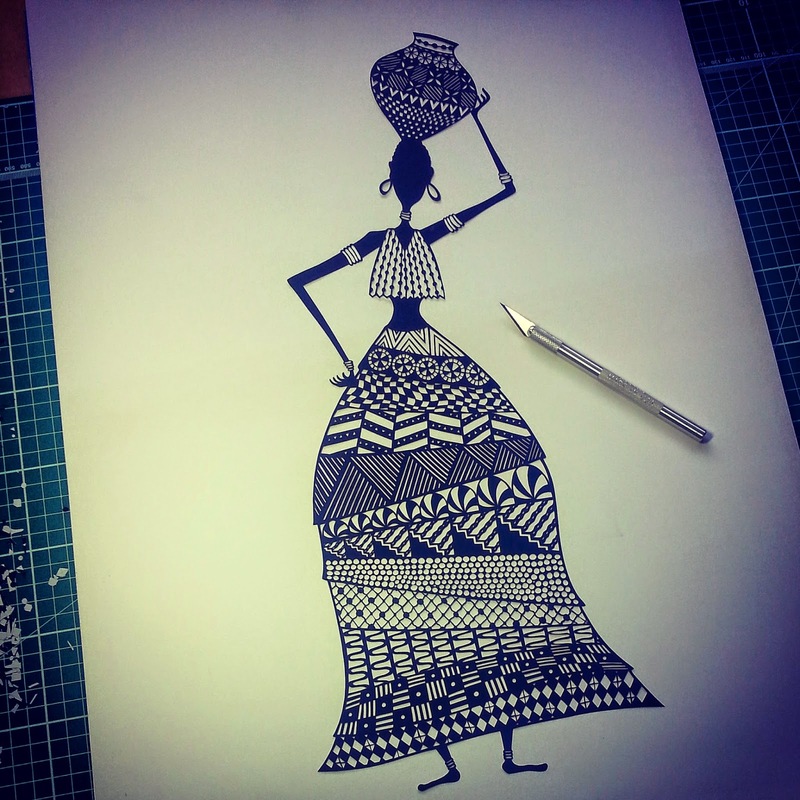 Then I copied my vectorised drawing and flipped it horizontally and matched up the two halves of my design. I then filled in the solid parts of my template with the live paint bucket in Illustrator - thus creating my symmetrical template. 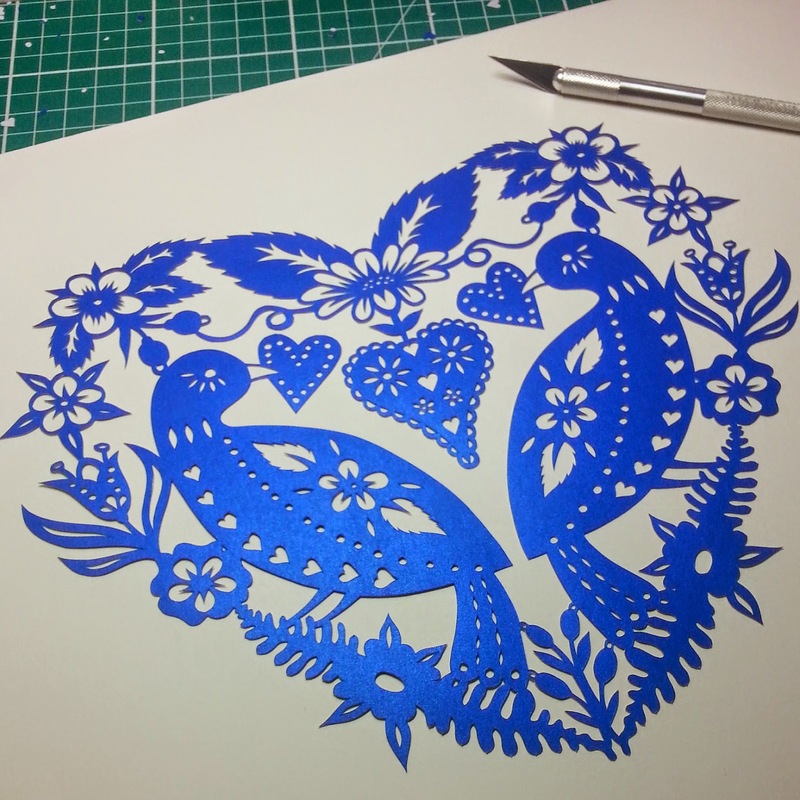 I was then able to print my template onto the back of this gorgeous pearlised blue paper (from Hobbycraft). But because I'm still very much a beginner at using Illustrator, there were some parts of the design I wasn't completely happy with - so I cut my design today from my template - but I tweaked it as I went along. This is the final result and I'm really happy with it. It was an interesting exercise! 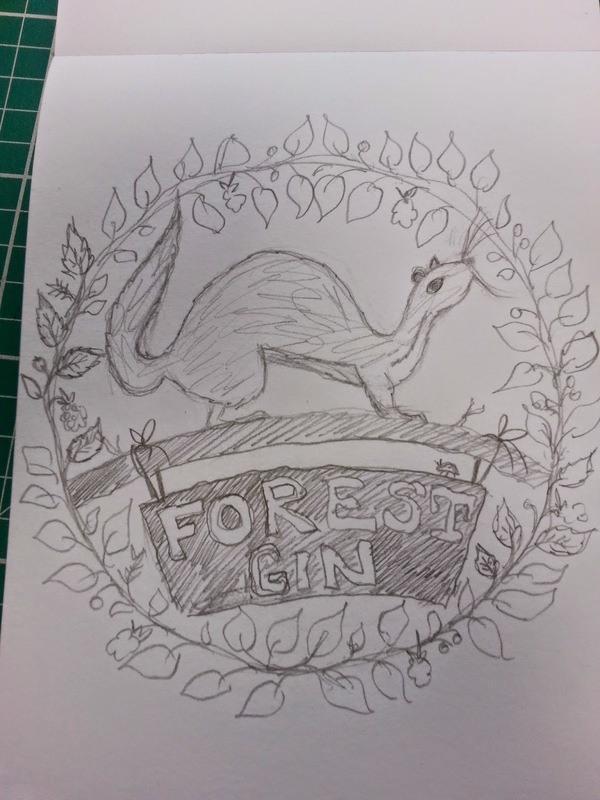 A few months ago I was asked to step in and help out a lovely guy and his wife who've developed an artisan gin. 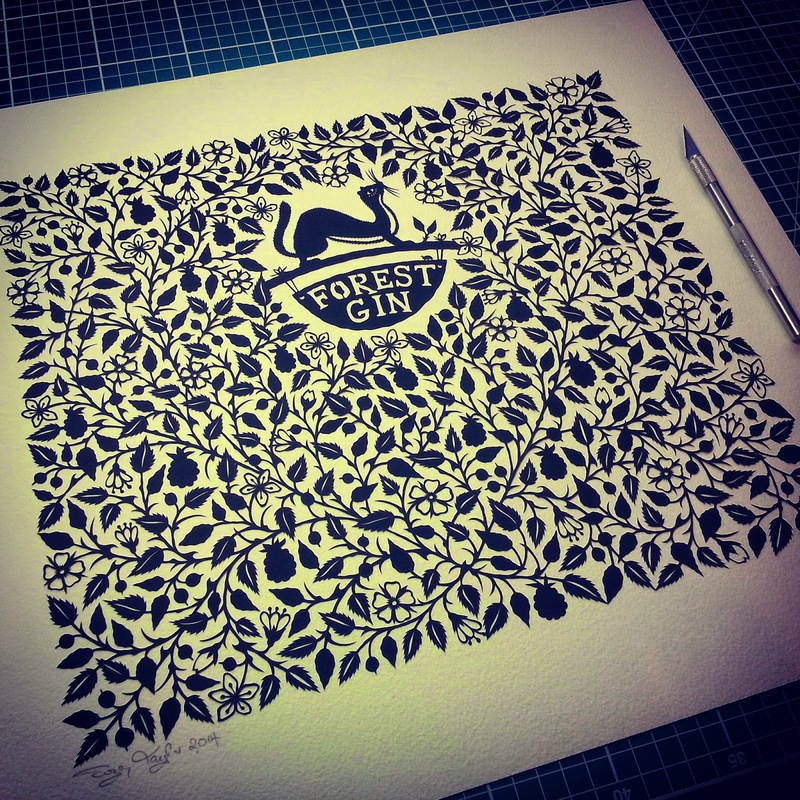 They gather all their botanicals from Macclesfield Forest in Cheshire. The brief was to create something that looked organic, rustic, wild and very non-corporate. 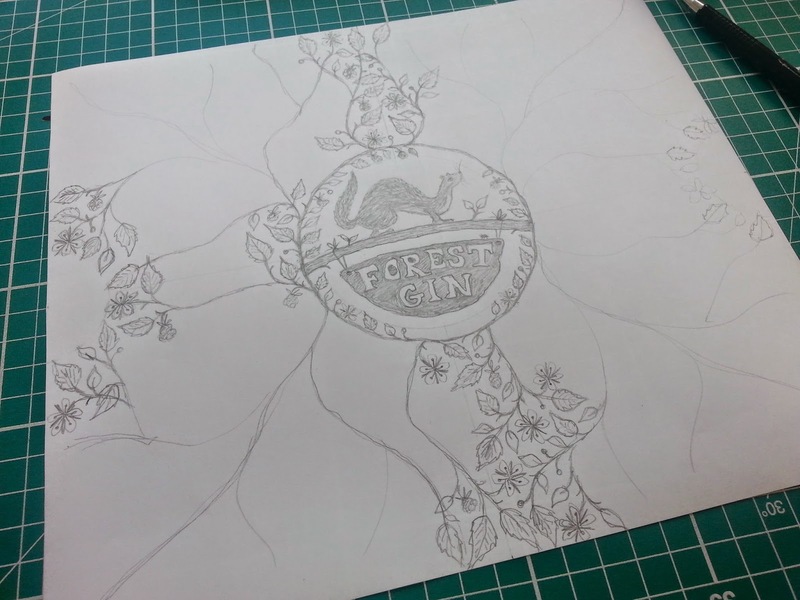 After a few sketches being emailed back and forth, we decided to go with an all-over bottle print based on the flowers and fruit of the ingredients in the gin itself. They also wanted to incorporate some sort of animal. After Googling and Wikipedia-ing Macclesfield Forest, it wasn't hard to discover that a native animal of the forest is the Weasel. 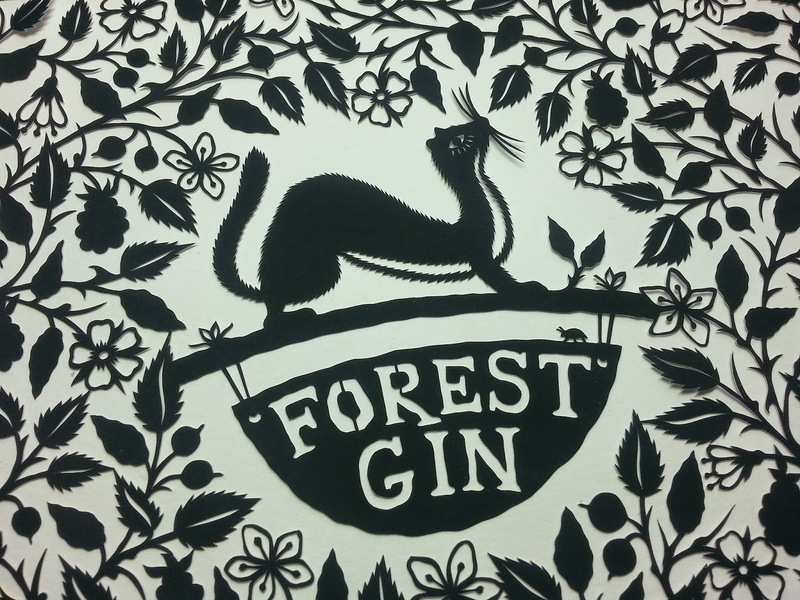 Not a common animal to find on a bottle of gin - or any other packaging for that matter! Which made it the perfect candidate for my client. 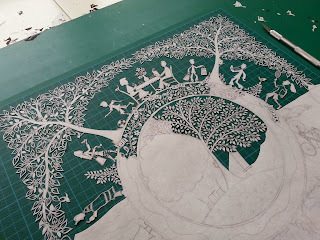 So below are some of the images of the process. 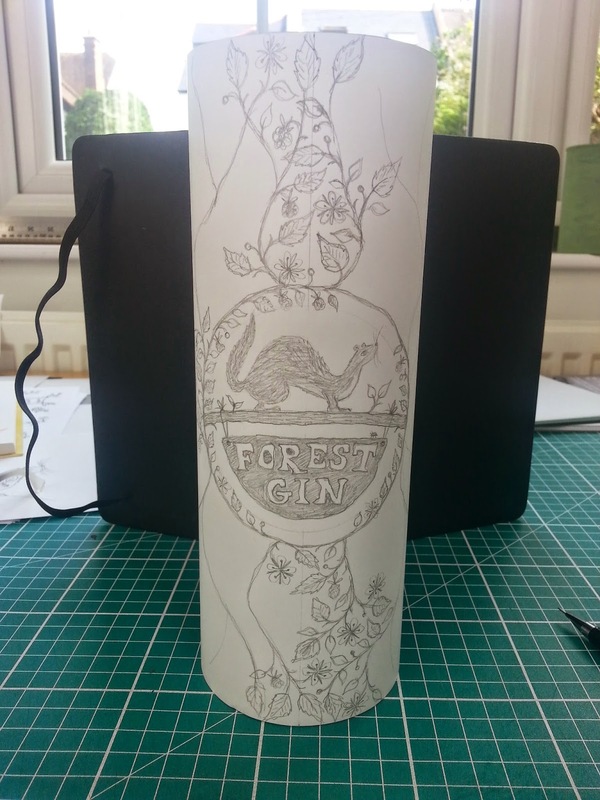 We're all thrilled with the final artwork and now I can't wait to get my hands on a bottle of the gin as soon as they're printed and filled! 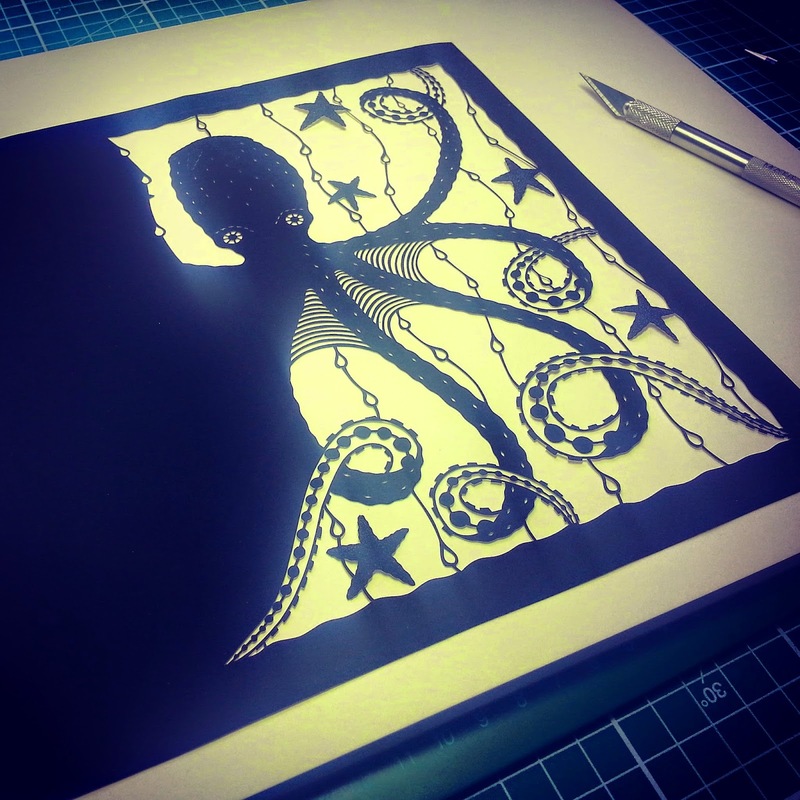 I've recently discovered how to frame pieces in a floating frame - I'm usually the last to catch on with these things! 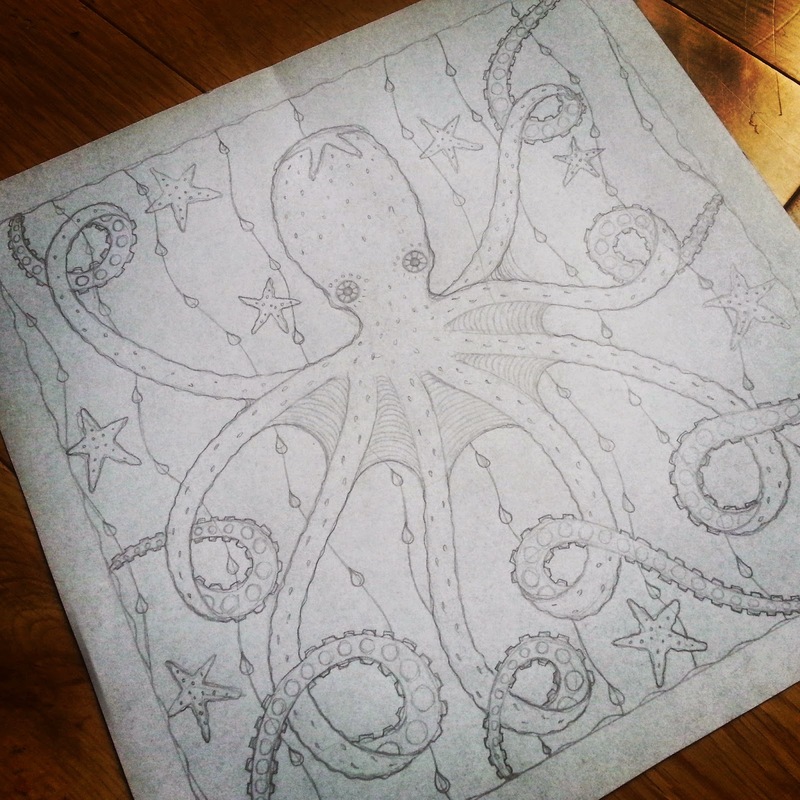 Anyway, I've decided to make an Octopus piece for the upcoming Christmas Fair at RHS Wisley in November. Here's what I've done so far. So I'm a very naughty blogger - have been so busy that things just haven't been posted here for a long long time. Here is a selection of a some of the work I've been up to recently! 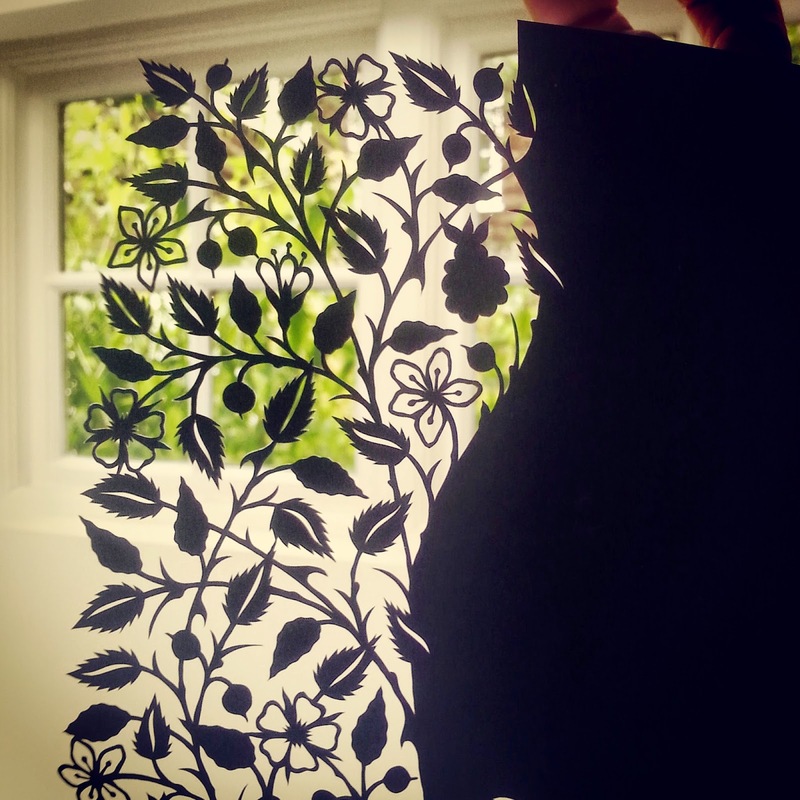 How to mount a papercut - the easy way! Probably one of the most frequently asked questions I get, is how on earth do I mount my work - as they're so fragile. Well, after many experiments, this is the most trouble-free method I have worked out and doesn't involve spray-mount or handling a sticky, gluey papercut. Fool-proof! 1. You will need two pieces of mounting paper/card. One piece will be the piece you mount onto and the other piece is a 'template piece'. They need to be exactly the same size and make them larger than you actually need the final piece to be. 2. 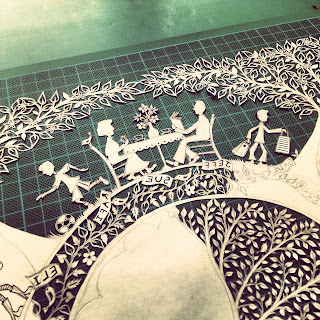 Lay your template piece of paper on the table and place your papercut (right side facing down) on top of the template. Place it approximately where you would want it to be mounted. 3. Now for the gluey bit. I use liquid pritt - but any white or clear tacky glue will do. 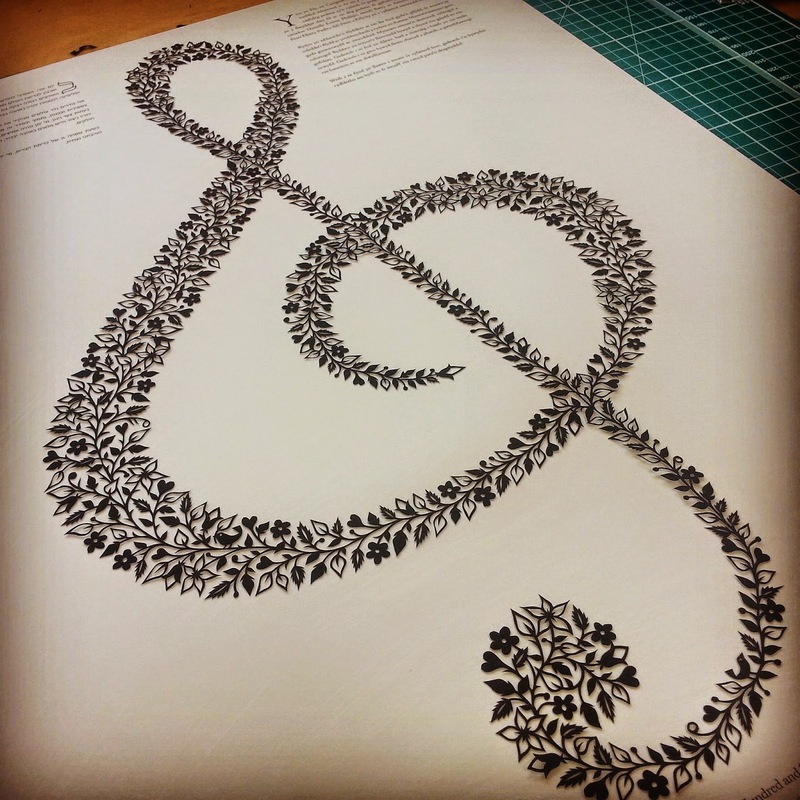 Be VERY sparing in the amount of glue you use as you don't want your paper to ripple on the surface. 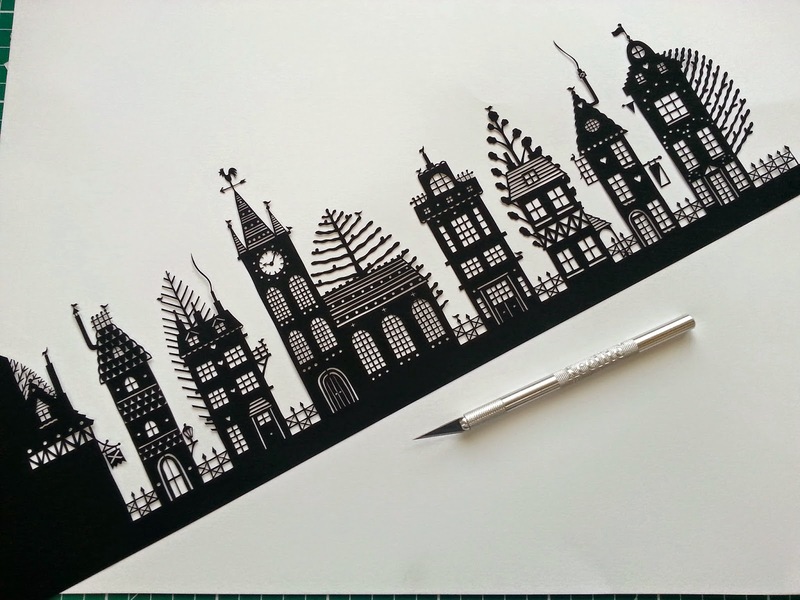 Using a very fine paint brush (or cocktail stick), dab tiny dots of glue over the back/wrong side of your papercut. It's amazing how little glue you actually need to hold it in place on your paper. Don't take too long at this stage as you don't want the glue to dry. 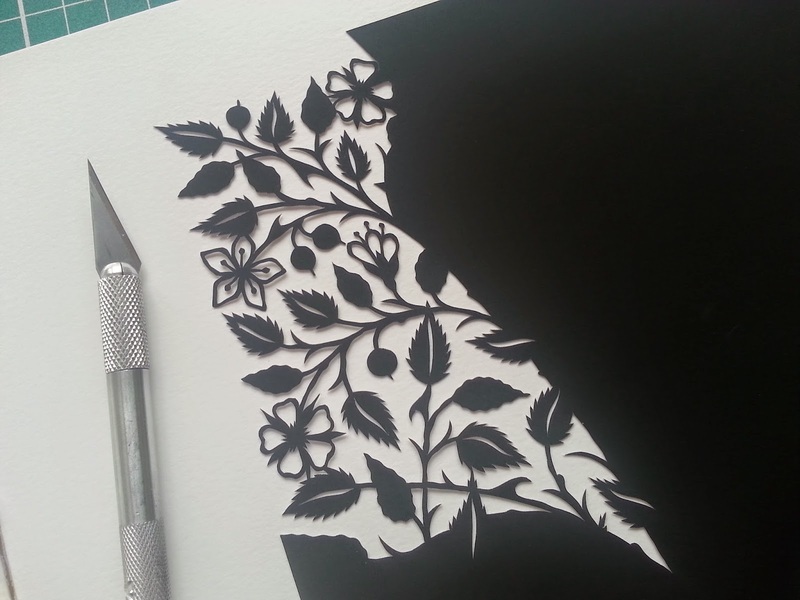 If your papercut moves a little, reposition it at this stage into the right place. Do not lift it. You can just slide it. 4. Take your other piece of paper/card (the piece for the actual mounting). Align the corners of this piece with the corners of the template piece and gently lower over your gluey papercut. 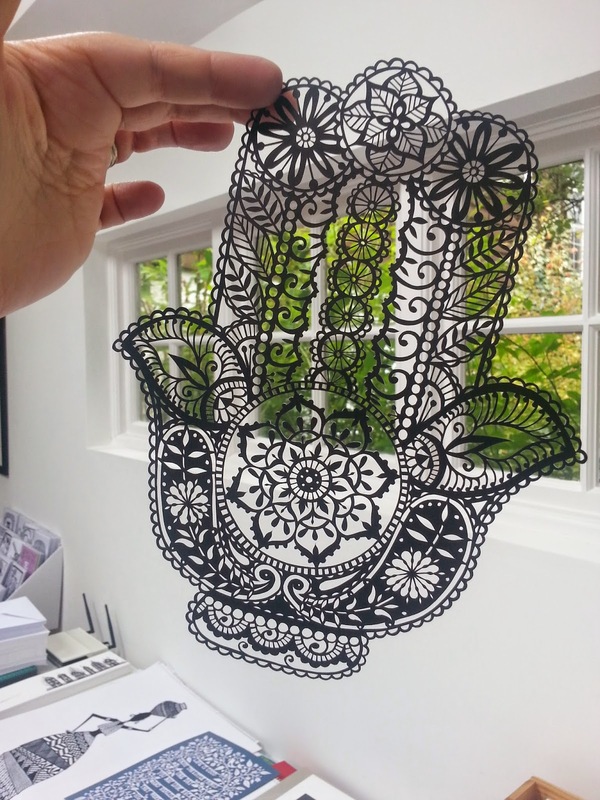 Now you can smooth over this piece without having to rub your hand over your actual papercut. 5. 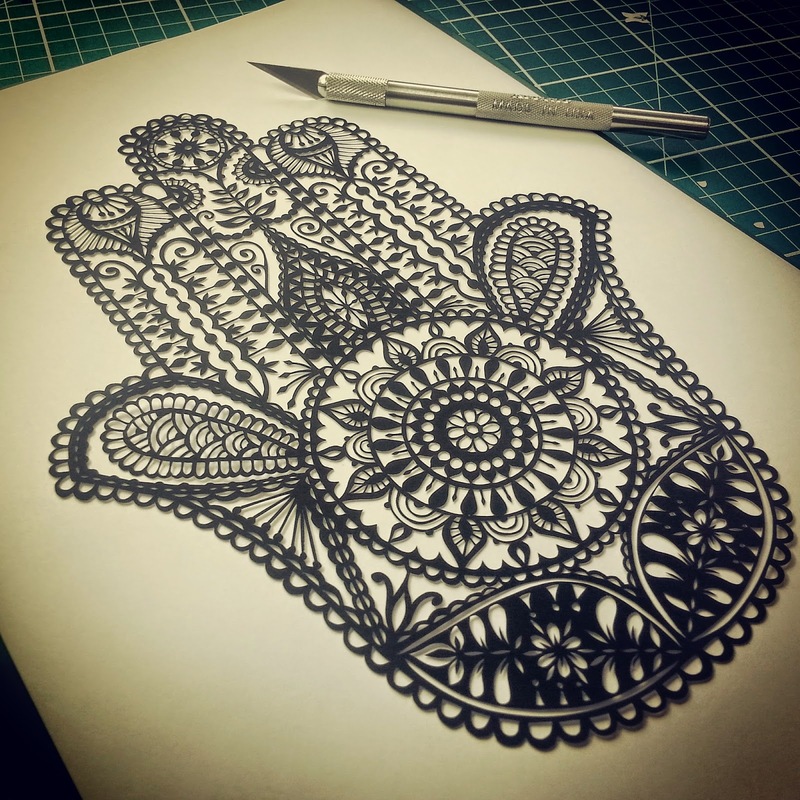 Turn over your paper and VOILA! Your papercut will be stuck to your mounting piece in the correct position. EASY PEASY! 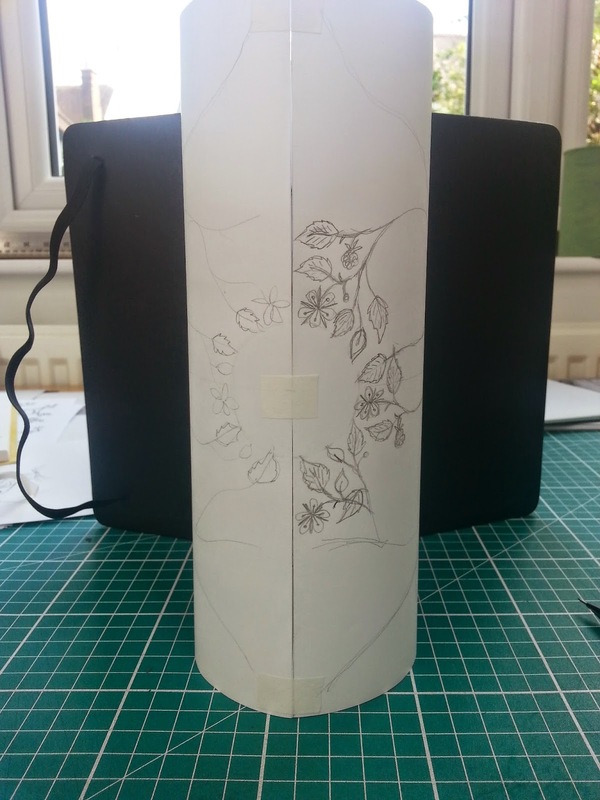 As you made the papers larger than you needed, this will also allow you to trim down the backing to the correct size or square it up if you went slightly wonky in the glueing process. 6. 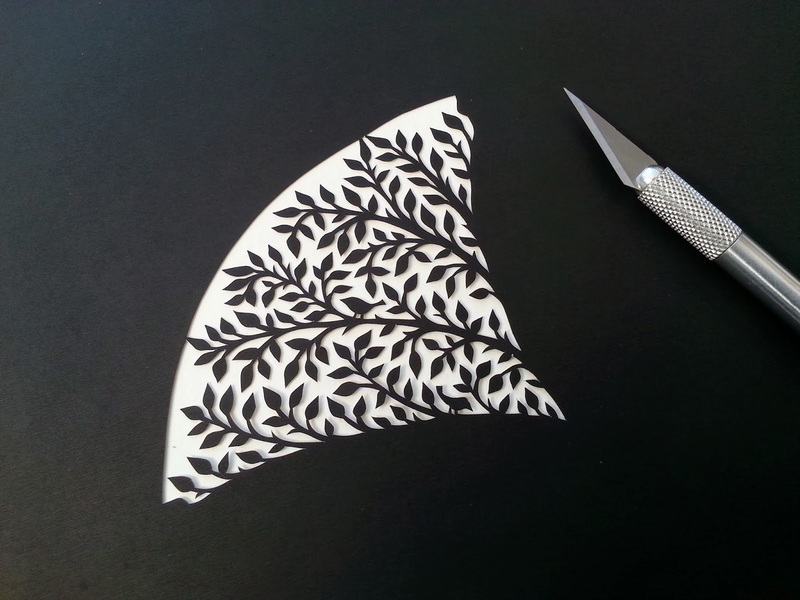 If any parts of your papercut are still flopping about, you can gently lift them with the tip of your blade and dab a little glue underneath to stick. Hope that's all clear. Sorry no photos to demonstrate. Will try and get some next time I mount something! I've been asked to create a large commission as a surprise anniversary present for a couple, depicting their children and grandchildren. 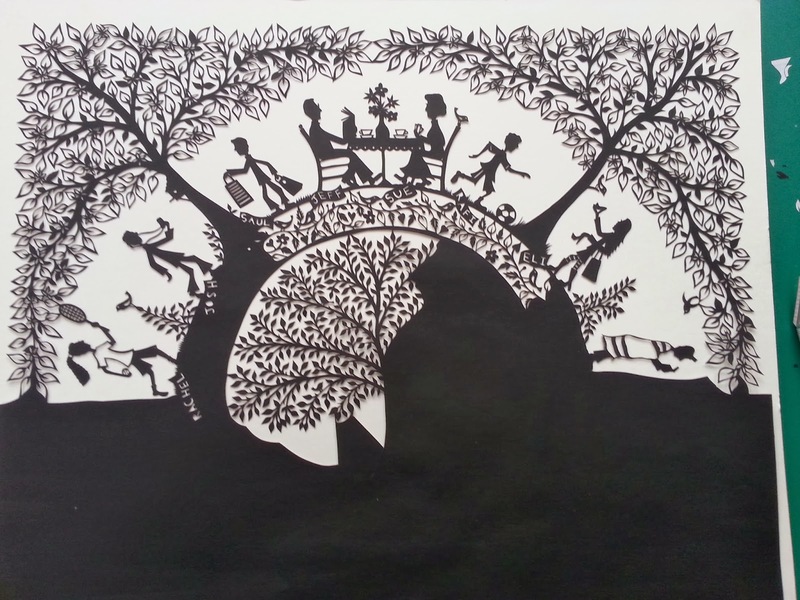 It's quite a complicated piece, incorporating many different elements. The challenge on this piece was very much the designing of it. I've started cutting it and I think it looks like it's going to be ok, thankfully! Happy Mitou! 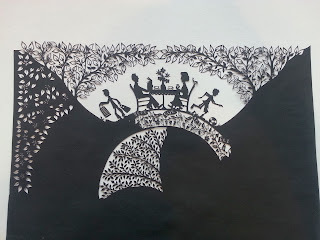 Illustration Blog !!! !